It's Taste Washington Wine Month! Celebrate by joining us for a tasting of wines from Bainbridge Vineyards! 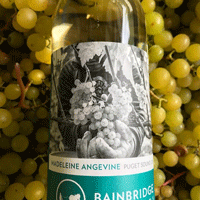 Our Wine Buyer Josh says, "Bainbridge Vineyards whites are light and somewhat aromatic, while the red is full and fruity with low acid." For more information about Bainbridge Vineyards and our Evening with Bainbridge Vineyards event, click here.